Date of introduction: 1992 Display technology: n.a. Size: 11.5" x 10.5" x 2.6"
of the TI-32 Explorer Plus with the electronics of the TI-30Xa Solar. These calculator all received some changes to the standard calculators like a more robust housing or disabled functionality. But what are the modifications of this toy compared to the original Touch & Discover introduced almost 5 years earlier ? Just take your time and watch the next six pictures carefully. First of all we notice immediately a blue housing instead the original orange design and the mentioned School Edition™ logo. 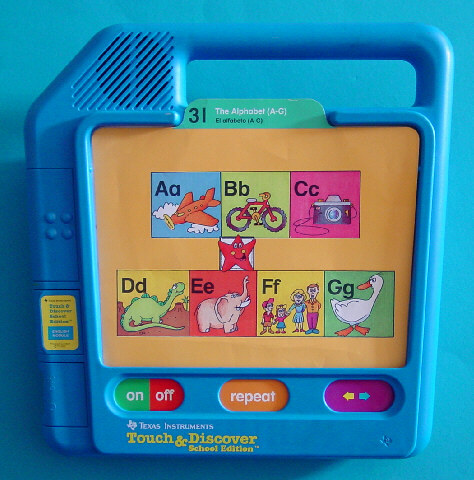 The two slots on the left of the educational toy are occupied, one holds a module with two connectors for an external power supply and a headphone. The other slot of the toy reads "ENGLISH MODULE", obviously the Speech-ROM. Dismantling the first module reveals a simple printed circuit board (PCB) with just the two connectors. We assume that this module could be assembled with Speech-ROM's, too. The second module indeed holds the english voices of the toy, its TSP60C80/CMM80008 Speech-ROM stores 1024kBit of information. Remember, this is 8 times of the original Speak & Spell modules. The main printed circuit board (PCB) of the Touch & Discover School Edition™ is different from the standard PCB. It makes use of the TSP50C42 standard voice synthesizer chip but lacks an external Speech-ROM. © Joerg Woerner, June 27, 2005. No reprints without written permission.